Food Costs > How Much Does Flour Cost? How Much Does Flour Cost? Even though there are many types of flour grinded from a variety of nuts and seeds, the most frequently used is the all-purpose flour. When used while baking, flour will contribute to the body, texture and flavor, binding the ingredients together to support the battery. It can also used to thicken sauces, creams, pie fillings and even be spread out on a surface to prevent a dough from sticking to the surface. How much does a bag of flour cost? On average, plan on spending anywhere from $2 to as much as $4 per five-pound bag. The cost will depend on the brand, quantity and where you purchase it from. Refer to our table below to see what the most popular brands and the many types may cost you at your local grocery store or online. Walmart, for example, sells more than 20 brands, with prices ranging from $2.50 for a five-pound bag of Gold Medal Flour to as much as $8 for a 25-pound bag of their Great Value brand. 50-pound wholesale bags, which are commonly found at restaurant supply stores and wholesale clubs, can cost close to $10 to $15 each. Almond flour, blanched from slivered almonds, can cost about $2 to $4 per eight-ounce bag. A four-pound bag, sold on Amazon, for example, sells for close to $30. Whole wheat flour, a flour made from 100 percent premium whole wheat, can cost about $4 to $10 per five-pound bag. Coconut flour, a flour people purchase as an alternative to wheat and other grain-based flours, comes from the dried, defatted coconut meat, and can cost about $4 per 16-ounce package. Unbleached flour, which ages naturally without using a chemical agent, can cost about double than the bleached variety mentioned above. Cake flour can cost about $3 per 32-ounces. While most of us think of the all-purpose flour when thinking about flour in general, there are quite varieties as you will soon find out in our table below. Listed in this table are the average prices for each type. The type of flour you use can and will affect the product you’re making. Flour contains protein, and when it’s able to come in contact with water and it’s heated, it will product gluten, which offers the elasticity and strength baked goods need. Since each type of flour will have a different amount of protein, it can affect the outcome in the end. An all-purpose flour, for example, has about a 10 percent protein content and is made from a blend of soft and hard wheat flours and can be either bleached or unbleached. Cake flour, on the other hand, will only have a six to eight percent protein content and will be made from a softer wheat flour chlorinated to break down the strength of the gluten, creating a smoother texture than other flour. Bread flour, as the name implies, is designed for just that — bread. This flour will have a higher protein count, around 14 percent, and will be made from a hard wheat flour. The higher gluten content will cause the bread to rise, giving it the strong shape and structure it desires. Always store your flour in a dry, cool place for up to six months. If stored beyond six months, it’s best to play it safe and discard it; however, if it smells bad or changes color before the six months, throw it away to be safe. All flours will have a limited shelf life. To prevent insects, consider using the refrigerator or freezer. If you do decide to freeze it, you will have to take it out 48 hours before using. 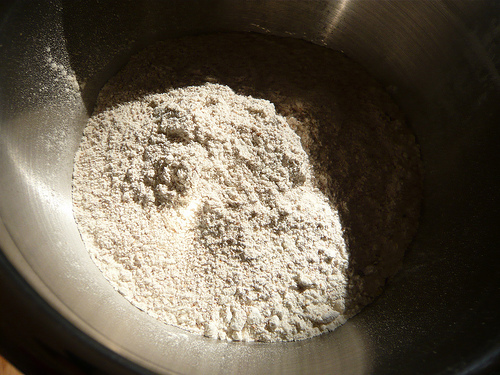 For those using a recipe, one pound of flour will yield 3 and 1/3 cup if you’re using an all-purpose flour. Flour is just that — flour. If possible, purchase store brand name to save up to 40 percent. Buying in bulk from wholesale clubs can often be the best way to save.